NAB AFL Auskick is a great way for boys and girls to learn the skills of Australian Football. This year, the AFL have launched a brand new Auskick program, Auskick 2.0, and the focus is on making sure the kids are always holiding a ball and always moving around. There is also plenty of opportunities for parents and carers of children to get involved and join in the fun, making auskick a great way to spend time with your kids, while teaching them key skills to be successfull playing footy and playing sport with others. 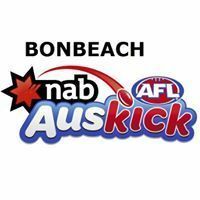 Bonbeach Auskick starts on 21st April, and will run for 12 weeks, excluding school holidays. We play on Saturday mornings, 9:30 till 11am at Bonbeach Sports Reserve, cnr Bondi Road & Scotch Pde, Bonbeach. The new auskick 2.0 program involves putting children into smaller groups of around 6 to 8 each, and playing heaps of games that focus on skills such as catching, kicking, dodging, jumping, and most importantly, having fun. We will start with a small 3 on 3 or 4 on 4 game of footy, then do some games, then finish with a quick game of footy. AFL have a wide range of instructional videos to make sure that it's really easy and fun for parents and helpers to get involved as well. We have a canteen run by volunteers. There is baconb and eggs rolls at the start, and the kids can get hot dogs after Auskick. We also have a coffee van which is very popular on a chilly Saturday morning. At the end of each session, kids are rewarded for their efforts and will be presented with awards from our sponsors. Bonbeach Auskick Footy boot exchange. If you have boots that no longer fit your little one, bring them in and add them to the boot exchange. If you find a pair that fits your child in the box you are welcome to them.